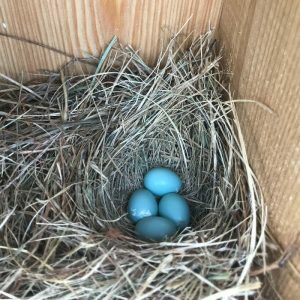 Efforts to support bluebirds at Tufton began several years ago through concerted involvement from Ron and Priscilla Kingston and members of the Monticello Bird Club who erected bluebird boxes in the display garden of the Center for Historic Plants. 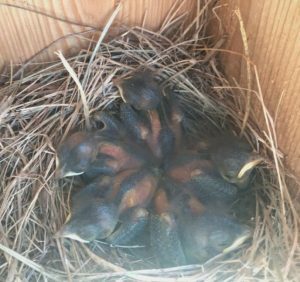 For those who have visited the Center for Historic Plants at Jefferson’s Tufton Farm, you have probably caught glimpses of our resident Eastern bluebirds (Sialia sialis). 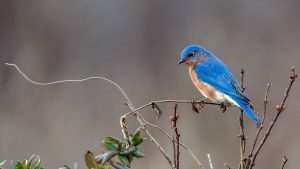 Tufton Farm provides ideal managed habitat for bluebirds with its abundance of pastures, fence perches and variety of tree species that provide food for birds through fall and winter. 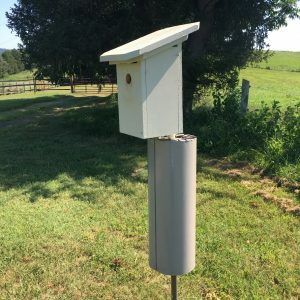 Although Tufton Farm is not regularly open to the public, participants in the Heritage Harvest Festival pre-event at Tufton Farm will have a unique opportunity to see our new bird boxes and many other recent on-site habitat improvements. “Jefferson’s Tufton Farm: Strong Roots, New Growth” will take place on Thursday, September 20th from 10 a.m.- 1 p.m. and will feature a behind-the-scenes walking tour describing Tufton’s archaeological past and future plans to restore farming to Monticello through the launch of an experimental farming center. Browse the Heritage Harvest Festival site for more information on all events.